I ate so much food whilst I was hiking. I was like a hungry hungry hippo. Oats. Either cooked or soaked overnight with lots of dried fruit and nuts mixed in. Cook your lunch the evening before when you are making your dinner to save time and washing up. Take tupperware with you to carry your lunch in. Rehydrate dried pineapple overnight and in the morning you can have plump pineapple to eat and pineapple juice to drink. Take way more food than you think you need. I ate so much more than I imagined I would. It is so important to get enough calories when undertaking any long endurance hike as food is fuel. You don’t want to be losing too much weight and running out of energy reserves when you still have a week of hiking to go. Dried foods are your friend! They are super lightweight so perfect for when weight is a problem. Jars are not your friends! They are too heavy to carry and it is near impossible to find recycling facilities when you are out in the sticks! Take calorie dense snacks. I’ll say it again – you will need more calories than you think! My favourite was halva and 9Bars. Pack some good coffee. I didn’t and I regretted it deeply. I’m taking my aeropress next time for sure. You can’t beat a good cup of strong coffee to get you out of your tent in the morning. Take your favourite snacks. You will be away from home and without your usual creature comforts. You may find your favourite snacks and treats comforting as well as satiating, especially if you are travelling alone. Take a nalgene or a metal flask for your water – these can double as a hot water bottle in the evening! Just pop your spare socks over it so you don’t burn yourself. Though I wouldn’t normally eat a lot of these foods at home, it is really important to get calories when you are out hiking! When you’re out in the fresh air and hungry from the hike food tastes so much better than it ought to!! What foods do you take hiking? What foods do you avoid taking? Where are you going on your next adventure? I’m not a hiker but I travel a lot so I like to be on top of my snack game! 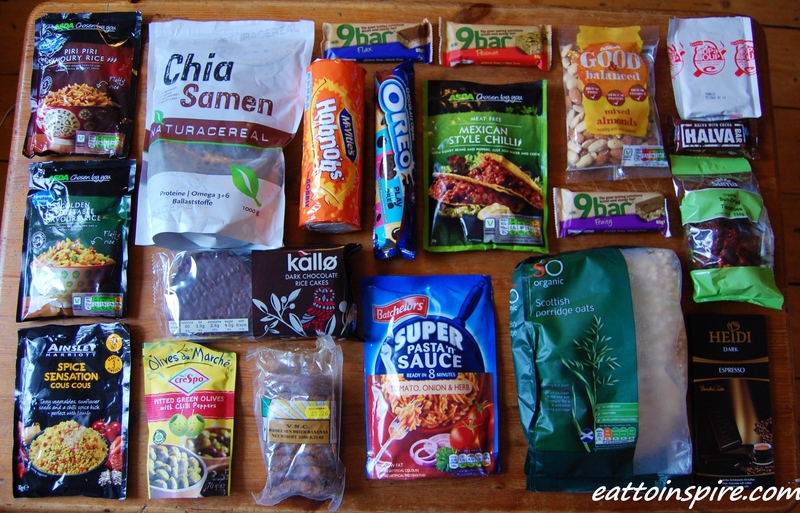 I love those Kallo rice cakes and I’m a bit fan of the chocolate covered Trek flapjacks and peanut butter Clif bars. I also had no idea vegan pasta ‘n sauce existed, I used to like one of the creamy cheesy ones way before I was vegan!